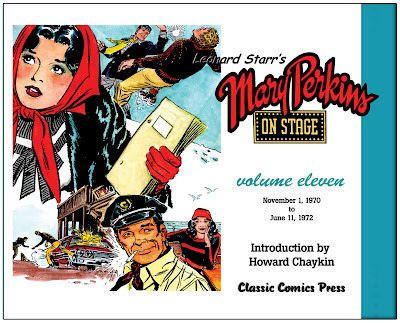 As stated in the previous posting, I'm a little bit behind - Leonard Starr's Mary Perkins On Stage Volume 11 will be listed in the November 2012 issue of PREVIEWS with a stated delivery date of January 2013. But...the book will actually be available in early December. This volume will be a whopping 264 pages with an introduction from Howard Chaykin, reprinting dailies and Sundays from November 1, 1970 to June 12, 1972! Pre-orders are now available from the Classic Comics Press website. To Pre-Order your copy of Mary Perkins On Stage Volume 11 - Click here!